As the countdown to Batman and Catwoman's upcoming wedding begins, a new variant cover showcases Catwoman's bridal party. Ale Garza's variant for Batman #50, celebrating the nuptials of Bruce Wayne and Selina Kyle, has Kyle and her bridesmaids front and center dressed for ceremony. 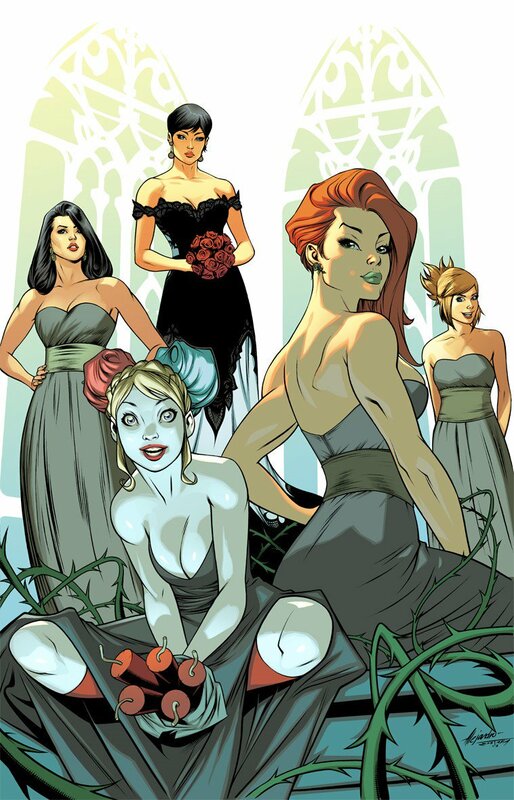 Included in the bridal party are Poison Ivy, Lois Lane, Holly Robinson, and Harley Quinn, complete with a bouquet of dynamite. Lane had previously gone on a double date night with Kyle and their respective significant others in Batman #36 while Quinn's inclusion confirms she will play a role in the wedding. A previously unveiled variant cover by Mark Brooks had teased that the Gotham City Siren would make an appearance during Bruce Wayne and Selina Kyle's happy day. A more intriguing addition to the bridal party is Holly Robinson. Robinson, a frequent ally of Kyle both in and out of the costume, was first created by writer Frank Miller and artist David Mazzucchelli in 1987's Batman #404 as part of their classic Batman: Year One storyline. 2017's Batman #15 saw Robinson kill hundreds of terrorists in retaliation for bombing the orphanage where she had grown up with Catwoman taking the fall for the murders to protect her. Robinson's return is sure to come with lots of unfinished business between the two characters though, with the Joker waiting in the wings, their unresolved issues may have to wait a bit longer.